I have an external drive that I want to use to back up files on both my Mac and my Windows PC. Mac uses Time Machine as its backup software, which is a very good program that takes a snapshot and backs up your entire computer. I like Time Machine because it is easy to use and makes a complete backup without having to individually go in and manually set up the files you want to back up. The problem with Time Machine though is that it only reads the Mac OS Extended (Journaled) file system, or HFS. This works great for Mac, but then the entire drive is not usable by Windows computers. Conversely, the traditional Windows file systems (NTFS, exFAT, FAT32) are not usable by Time Machine for creating backups. One solution is to create two partitions on a single external drive. 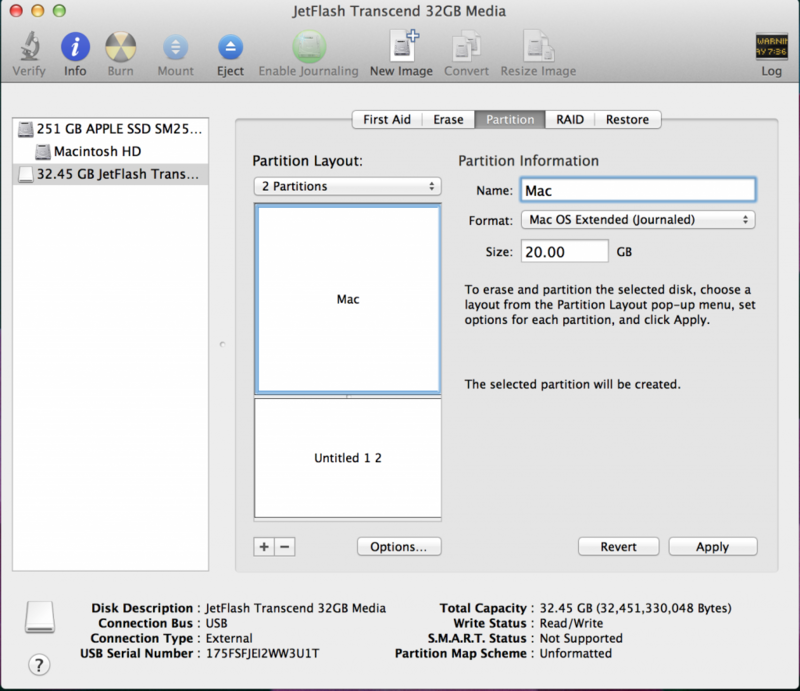 By creating two partitions, I can designate one for use on Mac and set it to Mac OS Extended (Journaled) format, then designate the other for use on Windows machines and set it to exFAT. This means that I can plug my external drive into my Mac and use one partition successfully for my Time Machine snapshots, then take the same external drive over to my Windows PC and use a different partition to back up my files there. There is no need to purchase two separate external drives for the computers. Below are instructions on how to set up an external drive or large capacity USB flash drive into two partitions. Before beginning, make sure to back up any important files that are already on your external drive onto another computer, as they will be deleted from the external drive in this process. 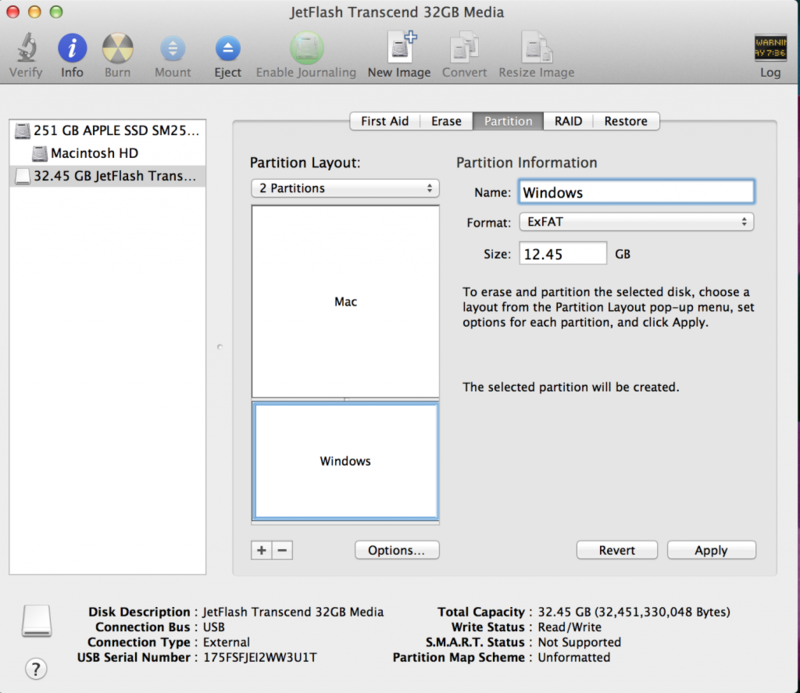 In the left box, highlight the drive you want to partition (in my example it is the JetFlash 32GB drive). In the right box, choose the option for Partition. Click on the + sign to choose how many partitions you want to add. 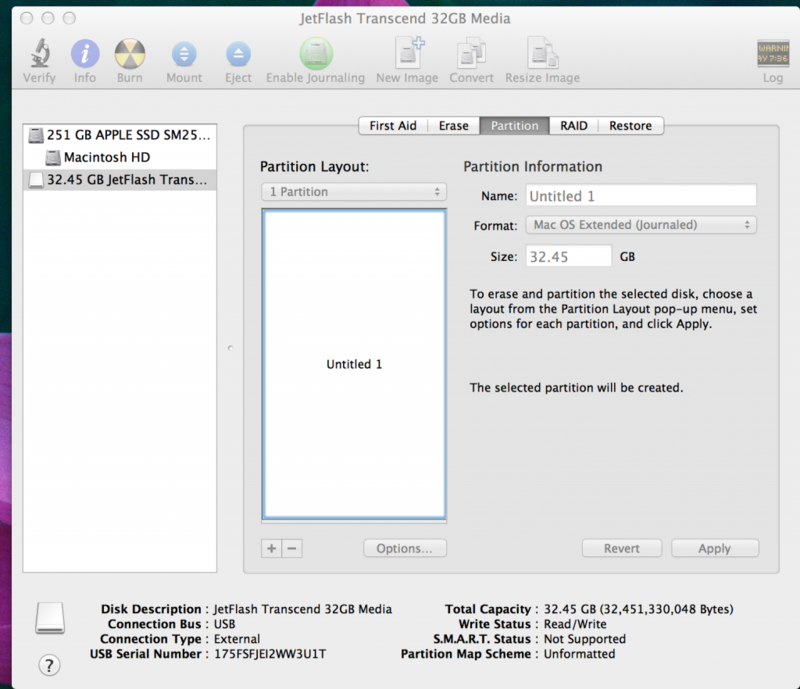 I labeled my first partition “Mac” just to make it easy on myself in differentiating between the two partitions. You can call it whatever you want to. For Format, be sure to choose the option of Mac OS Extended (Journaled). For Size, you will want to choose how much space you want to designate on the drive for this partition. I chose 20GB in my example. I named this partition “Windows”. For format I chose exFAT. For size I allocated the remaining 12.45GB left on the drive. Hit Apply when done. You will get a box asking you to confirm the partitions. Hit Partition to continue. When the process is complete, you will see two separate drives appear on your desktop. They should be labeled “Mac” and “Windows” (or whatever you named your partitions) accordingly. The partitions are now ready for use for backing up your information. Tags: partition external driveBookmark the permalink.